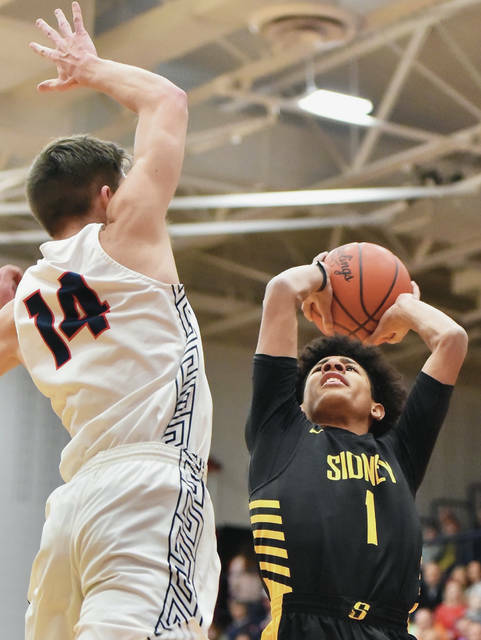 Sidney’s Lathan Jones looks to get past Piqua’s Kameron Darner during a Greater Western Ohio Conference American North Division game on Friday in Piqua. Sidney’s Andre Gordon dunks during a Greater Western Ohio Conference American North Division game on Friday in Piqua. He had seven dunks and finished with 28 points. 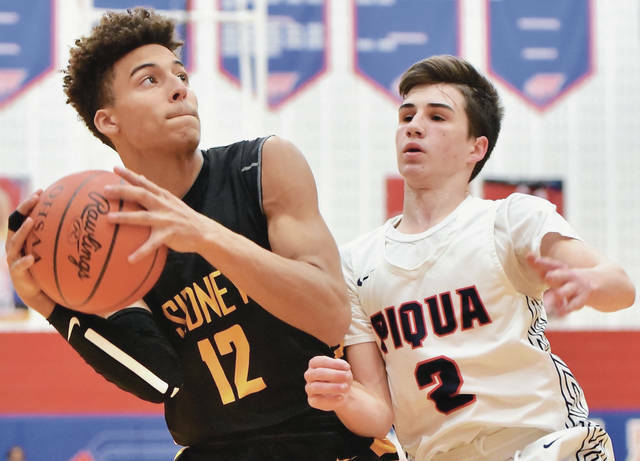 Sidney’s Ratez Roberts shoots with pressure from Piqua’s Trey Richmond during a Greater Western Ohio Conference American North Division game on Friday in Piqua. Sidney's Keith Lee shoots against Piqua at Piqua Friday. Sidney's Darren Taborn shoots against Piqua at Piqua Friday. 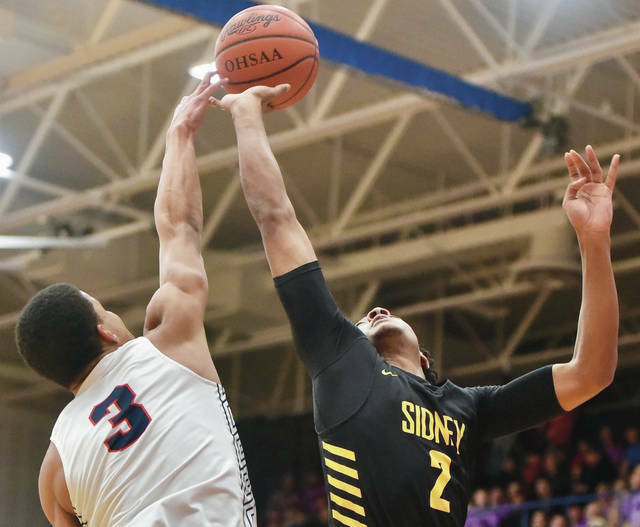 Sidney's Andre Gordon shoots against Piqua. Sidney's Andre Gordon drives past Piqua's Mick Karn at Piqua Friday. Sidney's Dominick Durr shoots against Piqua at Piqua. Ratez Roberts drives against Piqua's Trey Richmond at Piqua Friday. 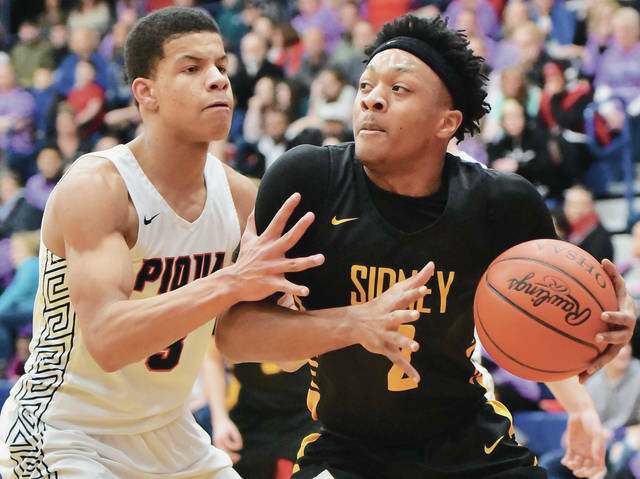 PIQUA — Sidney senior guard Andre Gordon wanted to end his career on a high note against archrival Piqua on Friday. He did — literally. Gordon, a Virginia Tech commit, scored his final points of the night on perhaps his highest dunk of the year. He elevated over a Piqua defender with about 4:30 and slammed the ball in the basket, with nearly all his arm up to his elbow going inside. It was one of seven dunks for the 6-foot-2 Gordon and seemed to take out what air the Indians had left away. 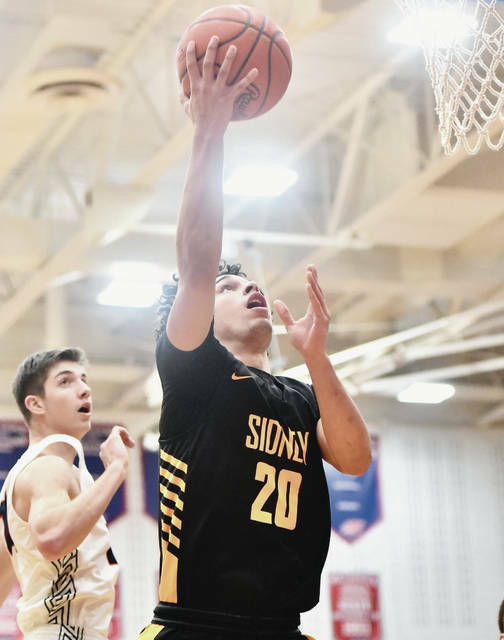 Sidney pulled away in the second half to earn a 72-41 victory in a Greater Western Ohio Conference American North Division game at Garbry Gymnasium. The Yellow Jackets (17-3, 11-2 GWOC North) can now turn their attention to Vandalia-Butler, which will travel to Sidney on Tuesday. Butler, which edged Troy 59-55 on Friday, is tied with Sidney for first place in the North. The Yellow Jackets stormed back and beat Butler 51-46 in overtime on Dec. 18 in Vandalia, which is the third consecutive year Sidney has won at the Student Activities Center. 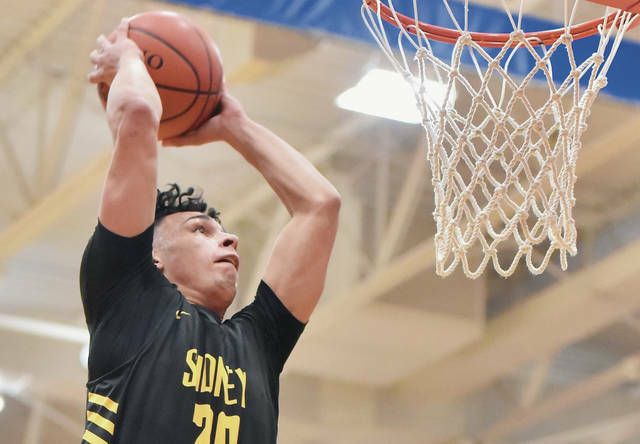 Butler has won its last two games in Sidney. Gordon finished with 28 points, which is the most he’s scored in a game against Piqua in his career. Senior forward Ratez Roberts finished with eight points, all in the first half. Junior guard Darren Taborn and Jones, a junior forward, added 10 points apiece. 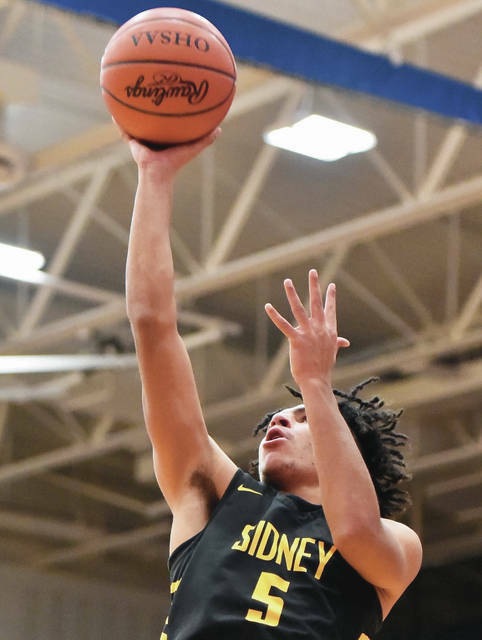 Sidney led 33-25 at halftime and quickly extended its lead in the third quarter. Gordon made a 3 from the left corner and Taborn followed with a basket to push the lead to 40-27, then Gordon made a another 3 and a dunk with 4:13 left to push the lead to 45-29 and cap off a 12-4 run. Iverson Ventura hit a 3 from the right corner to pull Piqua within 49-35, but Taborn, Gordon and Hudgins made a basket before the end of the quarter to extend the lead to 21 points. Jones and Hudgins opened the fourth with baskets to cap off an 11-0 run and put Sidney ahead 60-35. Qurri Tucker led Piqua (6-14, 3-11) with 15 points, 11 of which came in the first half. Willoughby credited Hudgins for shutting down Tucker in the second half. The teams traded points early but Sidney took the lead in the middle of the first. Keith Lee and Roberts made back-to-back baskets to put the Yellow Jackets ahead 14-10 with 3:46 left. Zack Lavey made a long jumper to bring the Indians within 16-14 with 1:29 left, but Gordon finished the finished the quarter with a steal and 360-degree dunk to increase the lead to four points. Roberts made a basket with 4:40 left in the second and followed 25 seconds later with a free throw to push the advantage to 29-18, but Piqua scored seven of the next nine points. Lee made a pair of free throws to put Sidney up 33-25 at halftime. Gordon was called for a technical foul for taunting after making his second shot of the game. He picked up a second foul late in the first half but went the rest of the way without fouling. Sidney’s Keith Lee shoots against Piqua at Piqua Friday. Sidney’s Darren Taborn shoots against Piqua at Piqua Friday. 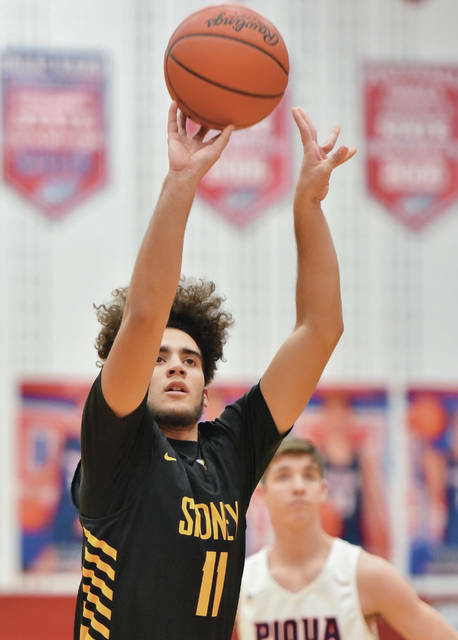 Sidney’s Andre Gordon shoots against Piqua. Sidney’s Andre Gordon drives past Piqua’s Mick Karn at Piqua Friday. Sidney’s Dominick Durr shoots against Piqua at Piqua. Ratez Roberts drives against Piqua’s Trey Richmond at Piqua Friday. 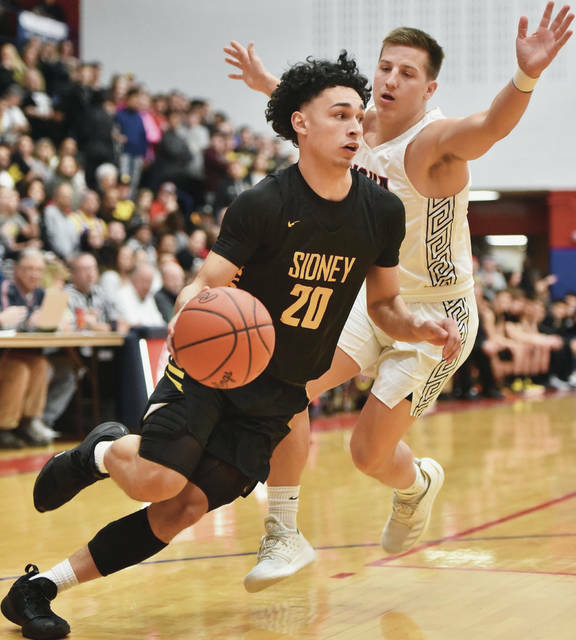 This entry was tagged American North, Andre Gordon, basketball, Darren Taborn, Division, Greater Western Ohio Conference, GWOC, GWOC North, high school, image, images, Indians, John Willoughby, North, photo, photographs, photos, pics, picture, pictures, Piqua, Ratez Roberts, result, score, Sidney, who won, Yellow Jackets. Bookmark the permalink.